Many teachers believe that the library center is the cornerstone of a good preschool classroom layout. Creating a print-rich preschool classroom is essential to building early literacy skills and outlining the importance of reading and writing. The reading corner or library center should always reflect the lesson plan theme and curriculum goals you have chosen. Be sure to change the books and decorations in your library center often to keep it fresh and exciting for the children. Comfortable seating is a must for your preschool library center. Ideas for creating a cozy place to curl up include beanbags, large pillows, and even child-sized armchairs. Be sure to place the library center in the quietest corner of your classroom. Ideally, the reading corner would be placed away from noisy areas such as the sensory table or block corner. If possible, create spaces within your reading corner that can only fit one child at a time. This concept can be achieved with furniture and pillows. 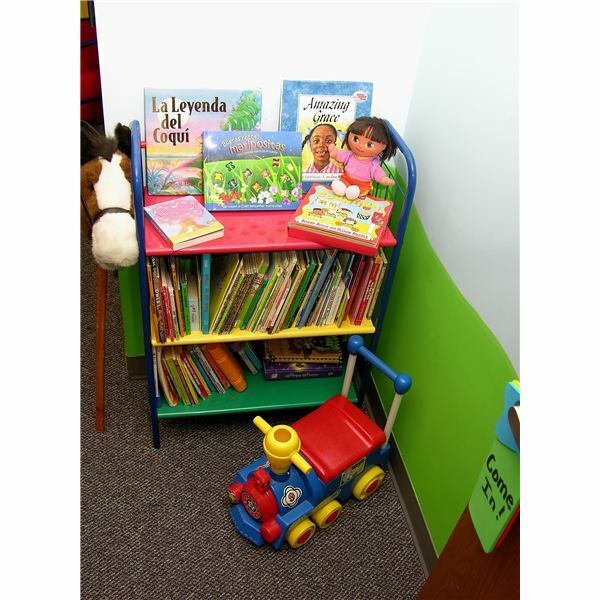 Use low shelves to display books in your preschool library center. At the beginning of the preschool year, it may be necessary to introduce children to the proper way to care for books. Show them how to turn pages carefully and remind them to tell you right away if pages accidentally rip. Often, modeling appropriate book handling and showing children how to care for classroom materials makes them more apt to show pride in their classroom. Taking care of books is a lesson that can be reinforced throughout the year. Show children how to carefully replace books on the shelf when they are finished reading them. Ask children for book recommendations and suggestions when changing the lesson plan theme. Let the children look through your collection of books and choose appropriate titles for each theme. In addition to books and shelves, the library center should be decorated in an inviting way. Take pictures throughout the year of children looking at books alone as well as in large and small groups. Post these pictures prominently in the library center. Ask children to draw pictures of their favorite stories. Label the art and display it in your reading corner. Include posters of places and things you may have read about during circle time or large group reading time. You can also use laminated book jackets to decorate the walls of your library center. Board Books – while some may argue that board books are for younger children, there are several titles available in board book form that are developmentally appropriate for preschoolers. Including these titles can often provide comfort to children, as they are usually titles they have seen before. You may also choose to include a space for magazines such as Highlights in your library center. Art magazines and things like Architechtural Digest and National Geographic may also be appropriate to include, as they often contain beautiful pictures that can be enjoyed by preschool children. Preschool library center ideas come from the author's previous preschool teaching experiences.